Here's where you'll find the best built A123 LiFe Nanophosphate* packs available anywhere. Each pack is carefully assembled, welded, cabled and finished to order for just the way you fly. We use 1/4" wide HD nickel quad welded straps and tabs, strain relieved 18g wiring and connectors are standard. Every pack is equipped with a simple cell tap for ease of balance charging and owner cabling for your favorite charger. We 'double shrink' each pack for fuel proofing and protection of the cardboard sleeves and the outer finish is with our superb 3M Mil Spec rubberised shrink. The packs I build for you are assembled to the same exacting standards we use for the Naval Research Labs and RPV / Robotics applications worldwide. If you want the best for your baby.. it's right here! For a really useful FAQ focusing on the needs of Giant Scale IMAC and 3D flyers considering this technology and some application recommendations for the folks flying 25% through 45% birds just click on the A123 FAQ on the navbar to the left. INFO!! The A123 Setup Guide.. diagrams, setup, charger and pack connector configurations explained! Check this out before you place your order! just click this text to go! INFO!! A123 'Combo Solution' 2500 Series Package Deals with price breaks on Combp gear ordered together. Scroll to the bottom of the page for details. INFO!! Jan 1 2019 - A123 Systems has been aquired by LITHIUMWERKS !! The A123 Systems Nanophosphate M1 & M1A cells have proven themselves to be the most serviceable Lithium technology pack available for Mid to Extreme Giant sized R/C applications in the last decade. 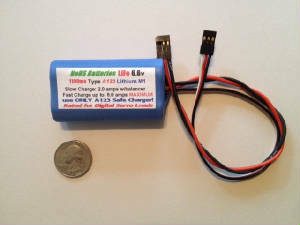 Here at last is a Lithium Technology that is stable, won't burn your plane, shop or house down if you do everything right, is exceptionally durable, offers superior life expectancy, is light weight, has exceptionally low internal impedance and does not require a regulator for use with modern radio equipment and digital HD servos. At this time we have the current R/C relevant cell offerings from A123 Systems, assembled right here into the pack configurations most commonly used by the discerning top end competitors in Giant Scale and IMAC 3D flying. The 1100 Series is popular as a dual receiver pack and ignition pack in DA-50 powered aircraft (20-27%) and the 2500 series packs are favored in 30-45% birds for both rx & ignition applications. If your new to A123 LiFe application considerations, be sure and check our FAQ for A123 Care and feeding Info, click the link of the navbar to the left. 2 cell 6.6v side by side Rx or Ignition packs are available with a 20g Combo Univ 3 wire Power and Balance feed OR with separate Univ 22g 3 wire balance feed and an 18g JR or FJ power feed at no extra charge. Options for the power feed include EC3, Deans, Multiplex, Power Pole, arranged as dual or single feeds, etc; see the drop down boxes for power feed options currently available. We also have available 3 and 4 cell ECU packs cabled as required for those applications. All A123 packs available with a 22g universal connector cell tap and one 18g Futaba J or JR/Hitec/AirtZ Connector! Dual Connectors add $5.00! Pack Size: 1-1/2”x 2-5/8 x 5/8"
NOTE: YES; we have adapters for the packs Univ balance plug or the 3 Wire Combo Connectors that will mate with chargers that use the JST-XH and FMA 'little white molex' connectors. Just scroll down the page for the A123 Accessories. All Turbine/ECU A123 Packs are available with Deans, EC3, Jetcat / Multiplex or Anderson Power Pole (sermos) plugs on 14g leads and with FMA balance tap ONLY. NEW! NoBS Batteries 'Combo Solution' UltraSwitch II for NoBS A123 packs w/ 20g 'Combo' Input Connector. Your choice of Dual 22g JR or 18g Single Jr/Univ, Deans or EC3 output connectors to the Rx! An outstanding evolution of the UltraSwitch II, set up exclusively for us by ED for our NoBS single lead Combo 20g A123 packs and optimised for Giant Scale applications with your choice of power output configurations. This switch is set up with a 20g 3 wire twisted input that compliments our A123 Packs with the 20g Three Wire Combo Connector, allowing single cable balance charging thru the switch at up to 4 amps. No Mods, no fussing about, order our A123 Packs with the single 20g Three Wire Combo Power Feed (NO separate balance connector!) and your installation is 'plug & play' simple with this switch. The switch output is your choice of either DUAL 22g Univ/JR leads for the Rx (best for single pack, single switch installations), a Single 18g JR/Univ or a single 18g Deans or EC3 output making it ideal for Parallel A123 pack and switch setups and/or SmartFly type power boards with the Deans or EC3 plugs common in high load applications for 30-40% IMAC and Warbirds. *Note: A123 rated, Designed specifically for 2nd generation single lead balance charging! If you have a 1st generation two lead balance charger, use the 'Combo' charge cord sold below; NO SEPARATE CHARGEPORT REQUIRED! The correct A123 pack connector configuration for this switch is WITHOUT a separate 22g balance lead and WITH the Combo 20g three wire Power Feed. Combo 20g Three wire Balance Input for NoBS A123 packs, your choice of either Dual 22g JR univ out OR Single 18g JR/Univ out to Rx. Deans, EC3 or Multiplex $5.00 more. This is an outstanding HD switch for 20-40% scale projects, allowing balance charging and individual cell voltage checks via the switch chargeport. With the Dual 22g JR/Univ out option the Combo Switch is especially suited to agressive 20-27% sized projects where a Single pack will be used but an additional connection to the Rx is desirable to spread out current loading. Set up with the Single 18g Univ JR connector or Deans, EC3 or Multiplex outputs it is ideal for parallel Pack configurations in the big birds when two packs and two of these switches are used to double available capacity, improve power handling and provide complete power system redundancy. Comes with 'switch guard' faceplate, closeable chargeport hood and makes for a very neat, easy to install assembly. Very light (.7oz) & durable.Max charge rate through the charge port is 4 amps. $24.95 , + $5.00 for Deans, EC3 or Multiplex outputs. Wish your two lead A123 charger could balance charge with just one connection to the pack thru your chargeport switch? This excellent Combo Chargecord works across a broad spectrum of JST-XH balance port or board compatible 2 lead (1st generation) chargers like the TP 610C, B6AC, Hitech X1, X2, X4, Venom, ElectriFly, etc; Allows single cable balance charge connection to the pack if used with any NoBS A123 Rx or Ignition pack equipped with either a single 20g 3 Wire Combined Univ Balance & Power Feed, or a Deans or a JR/Univ power feed with separate Univ balance lead with any of the switches shown below!!. Makes balance charging with most 2 lead chargers through a single HD chargeport switch simple and easy WITHOUT a separate chargeport and it's fully compatible with Balance Buddy too! Just plug the XH connector into the charger's balance board/port and the banana plugs into the chargers standard output and you are ready to enjoy single lead charging convenience via the switch chargeport! *Check your chargers manual for JST-XH plug compatibility!! Robust HD charge cable is 18" long! Plug & Play balance charging for NoBS A123 Rx/Ignition pack with a Combo 3 wire Univ pack feed and our Custom Combo UltraSwitch shown below. For use with 2 lead chargers that have a JST-XH compatible balance board or output port; intended for NoBS A123 2 cell Rx & ignition packs used with any of the NoBS A123 rated switches shown below. See our A123 Setup Guide for info on standard system chargeport switch modding requirements for most other type chargeport switches. Finally.. a Combo Solution Charger Cord just for the FMA Power Labs. Sets up the PL6, PL8, Dual Power Lab & 10S / 10XP for simple sigle lead balance charging via one connection to the pack or switch. In all respects, it's the same as the Combo Cord shown above but set up to work with FMA's Power Lab Series Chargers oddball JST-PA type modular ports. Intended for NoBS A123 2 cell Rx & ignition packs equipped with 20g 3 Wire Combined Univ Balance & Power Feed connected to a modified JR/Univ HD Chargeport switch or our Combo Switch See our A123 Setup Guide for info on the switch mod. Check your FMA charger's modular port(s) for pin count prior to ordering. 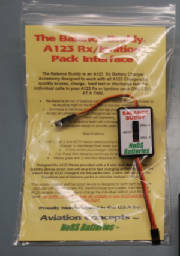 For use with 2 lead FMA chargers that have a JST-PA output port; intended for NoBS A123 2 cell Rx & ignition packs used with any of the NoBS A123 rated switches shown below. See our A123 Setup Guide for info on standard system chargeport switch modding requirements for most other type chargeport switches. JST-XH & FMA CellPro Charger to Univ Cell Tap Adapter Cables. *Note: If you planning on buying an FMA Multi-4 Charger from us we include the correct FMA adapter cable with it at no extra charge. Already have an A123 capable charger? Then you'll need this female charge plug to mate with your chargers molex balance port plug. 22g, 12" length, pre tinned leads. Female connection for Univ Chargeport, 12"
Quick access to your NoBS 6.6v packs individual cells for checking cell balance or charging indivdual cells. Comes with Univ system connectors for direct access to any NoBS A123 pack. A must for correcting QUICKLY a major cell imbalance at the field without waiting for a balacing charger's 100 to 200ma 'balance' charge rate to get the packs individual cells back in balance. For more info on how and when to use the Buddy, click the Picture >>. Univ Chargeport for Univ Celltap. Permits external balance charge access to the pack thru the fuselage side. NOT for use with an Cellpro pack tap, this is for use with packs with Univ celltap. See our Setup Guide (link above) for installation details. Excellent quality HD system switches, perfect for dual pack/parallel setups and Ignitions. Rugged and durable. Available for Futaba or Universal/JR system connectors. Can be user modified for the Combo 3 wire single lead NoBS A123 packs. See our A123 Setup Guide (link at the top of the page) for details. *Note: A123 rated, Can be used with two lead balance chargers that are equipped with a 'Combo' charge cord AFTER user modification. For more chargers, cabling, switches and HD 20g servo or pack extensions and other setup and support equipment, check our Chargers and Accessories page, just click the link on the navbar to the left. 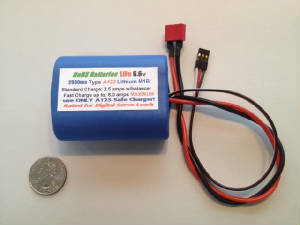 *A123 & Nanophosphate are trademarks of A123 Systems, Inc. All A123 cells and chargers assembled and distributed by Hangtimes Hobbies and NoBS Batteries are acquired from A123's sole licensed US Distributor. All rights to A123 technology and trademarks reserved by A123 Systems Inc.